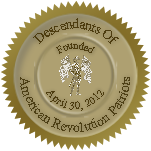 The members of the DESCENDANTS OF AMERICAN REVOLUTION PATRIOTS (DOARP) are committed to posterity in preserving the principles of Freedom and Liberty for all Americans and to provide the community with Patriotic Principles as set forth by our Forefathers. We are committed to honoring American Revolutionary War Citizen Soldiers that participated in the War. The Descendants Of American Revolution Patriots is dedicated to perpetuating the memory of those who, by their Services or Sacrifice, achieved the Independence of the American People. The symbols of the DOARP are the Revolutionary War Minuteman, the Thirteen Star Flag with canton of five rows of stars – three over two design, and the Fifty Star American Flag. The mantra of the DOARP is Libertas, Justitia, Aequalitas. The colors of the DOARP are red, representing the blood of Jesus Christ shed on the cross and the blood of the Patriots shed on the field, and blue, representing vigilance and perseverance. The Descendants Of American Revolution Patriots serve members in the State of Tennessee currently and will expand to other States as members are added. Carry out the purposes expressed in the Preamble of the Constitution of our Country and the injunctions of George Washington in his farewell address to the American People.